Here is my recipe for making homemade liquid laundry soap. I have tested and used this soap for nearly a year now with great results. It cleans clothes well and is also a great stain remover. 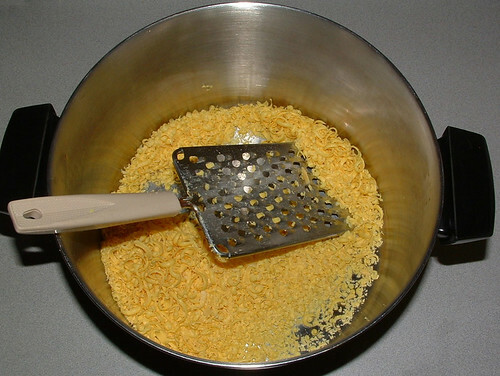 Grate 1/2 of the bar of Fels-Naptha soap and place in cooking pot. 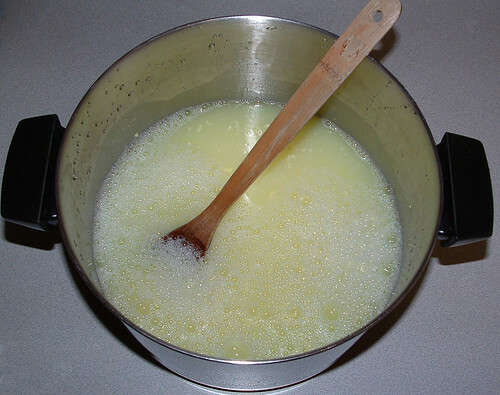 Add 6 cups water and heat gently over low to medium-low heat stirring occasionally until the soap melts. Keep the heat low as not to allow the soap cooking to bolt while the soap flakes are melting. 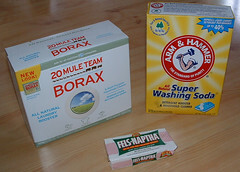 Once the soap flakes have melted, add the washing soda and the borax stirring until all ingredients are dissolved. Add 4 cups of hot water into the cooking pot and stir well. I added 8-10 drops of lavender essential oil to the soap mix at this point. This is an optional ingredient but the oil gave my final soap just a pleasant hint of fragrance. 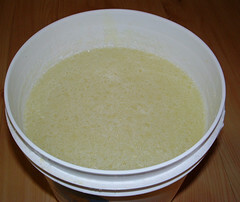 Now add 1 gallon of hot water to the plastic bucket mix, add soap mixture from the cooking pot, and stir well again. 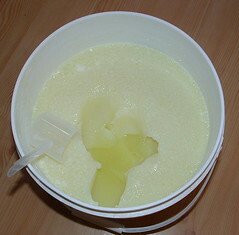 Let the soap mixture sit at least 24 hours to gel. The soap has an egg look to it. Here is a photo taken after I used a few scoops from the bucket. As you can see from the picture below, it has a crust on the top and that runny egg look underneath. But you just scoop out a glob and it works great for washing. I use 1/3 cup of soap in my top-loading large washer. For best results I place the soap in the washer and use a little hot water to dissolve the soap before placing my clothes into the washer. Also this laundry soap is a low sudsing soap so don’t be alarmed when you don’t see many suds while your clothes are washing. Additionally this soap can be used for stain treatments by either pre-soaking or spot treat the stain directly with a small amount of soap before washing. I’ve used everything except the Fels-Naptha laundry soap. Definitely make a difference in your laundry.